Pay Less, Get More Care! At Value Care we understand the difficulty of caring for a loved one alone. Our mission is to find quality and compassionate companion caregivers for those in need – at the most reasonable costs. We believe our clients should be able to afford the care they need. Whether you or someone you love needs full time companionship, someone to help around the house a few times a week or around the clock, our Care Match Program ensures we can match the most qualified and competent companion care for your needs. We thoroughly screen each caregiver who applies to register with us through legally required screening processes. We have also developed our own screening methods, which we call our FIVE STAR PROMISE. This series of screenings and tests ensures each companion has ample experience, references, verbal and written communication skills, and transfer technique proficiency. We want our clients to be confident that they are in good hands with the companions we refer. Errands; help with shopping or running other errands, accompaniment to doctor’s appointments or going to visit friends, and anything else our clients may need. 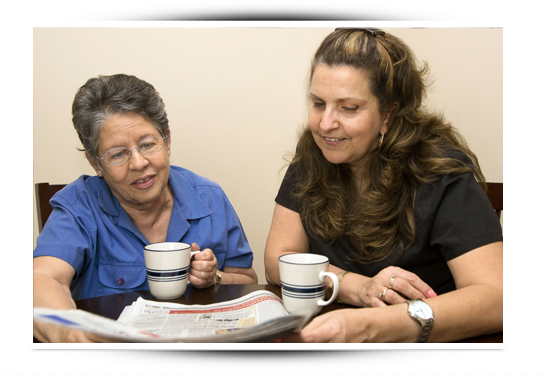 Companions provide help when and where our clients need it. Whether our clients are at home, in an independent living facility, hospital, or elsewhere, the companions we refer will come to them. We verify the qualifications of companion care professionals with our FIVE STAR PROMISE. At Value Care we genuinely care about our clients and want to match them with the best possible companions in Florida. Contact Us and find out how we can help you and why we guarantee our ability to match companions and clients through our First Day Satisfaction GUARANTEE. Value Care’s goal is to keep costs as low as possible for our clients, so they can find the help they need at the most affordable costs available. Our clients save 25% or more off average industry prices for companion care. Call Us Today if you are in need of qualified and compassionate companion care.